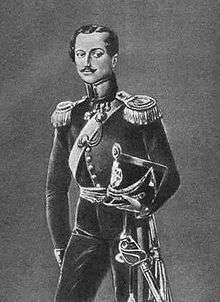 Prince Alexander Chavchavadze (Georgian: ალექსანდრე ჭავჭავაძე; Russian: Александр Чавчавадзе) (1786 – November 6, 1846) was a notable Georgian poet, public benefactor and military figure. Regarded as the "father of Georgian romanticism", he was a pre-eminent Georgian aristocrat and a talented general in the Imperial Russian service. Alexander Chavchavadze was a member of the noble family elevated to the princely rank by the Georgian king Constantine II of Kakhetia in 1726. The family was of Khevsur origin but had intermarried with other Georgian military and noble families. He was born in 1786, in St Petersburg, Russia, where his father, Prince Garsevan Chavchavadze, served as an ambassador of Heraclius II, king of Kartli and Kakheti in eastern Georgia. Tsarina Catherine II of Russia was a godmother at the baptism of infant Alexander, showing her benevolence to the Georgian diplomat. Alexander’s early education was Russian. He first saw his native Georgia at the age of 13, when the family moved back to Tiflis after the Russian annexation of eastern Georgia (1801). At the age of 18, Alexander Chavchavadze joined Prince Parnaoz, a member of the dispossessed royal family, in the 1804 rebellion in the mountainous Georgian province of Mtiuleti against Russian rule. Following the suppression of the uprising, he was briefly put in prison where he composed his first literary works, including a radical poem written in Georgian, Woe to This World and Its Tenants (ვაჰ, სოფელსა ამას და მისთა მდგმურთა). The poem quickly gained popularity, and brought early fame to its young author. His manuscripts were widely circulated with his lyrics of love or protest, written in the spirit of the 18th-century Georgian poet Besiki or of the French French Enlightenment philosopher Jean-Jacques Rousseau, sung in Tiflis and elsewhere in Georgia. In 1817, Prince Chavchavadze became a colonel of the Russian army. Promoted to Major General in 1826, his military career advanced remarkably during the Russian wars against the Persian and Ottoman empires in the late 1820s. He was instrumental in the conquest of Iravan from Persia in 1827 and was appointed, in 1828, a military governor of the Armenian Military District. During the 1828-9 Russo-Turkish war, with a small detachment, he organised a successful defence of the Yerevan province against the marauding Kurds and his forces surged into Anatolia, taking control of the whole pashate of Bajazet from the Turkish forces from 25 August to 9 September 1828. 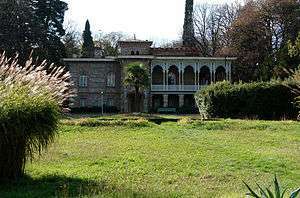 In 1829, he was dispatched as an administrator of the military board of Kakheti, where his patrimonial estates were located. Back in Georgia, Alexander enjoyed overwhelming popularity among the Georgian nobility and people. He was highly respected by his fellow Russian and Georgian officers. At the same time, he was regarded as Georgia’s most refined, educated and wealthy 19th-century aristocrat, fluent in several European and Asiatic languages and with extensive and friendly ties with the cream of Georgian and Russian society who frequented his famous salon in Tiflis. The prominent Russian diplomat and playwright Alexander Griboyedov married his 16-year-old daughter Nino, whom the famous Russian poet had tutored in music during his brief stay in Tiflis. 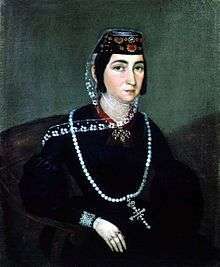 Another daughter, Catherine, married David Dadiani, prince of Mingrelia, and inspired in Nicholas Baratashvili the hopeless love that made him the greatest poet of Georgian Romanticism. 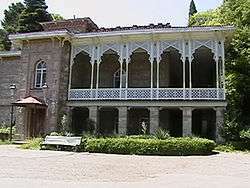 At his Italianate summer mansion in Tsinandali, Kakheti, he frequently entertained foreign guests with music, wit, and – most especially – the fine vintages made at his estate winery (marani). Chavchavadze built Georgia’s oldest and largest winery where he combined European and centuries-long Georgian wine-making traditions. The highly regarded dry white Tsinandali is still produced there. According to his acquaintance, Juan Van Halen, Chavchavadze, "a Georgian prince, educated in Europe,... though serving in our regiment with the rank of colonel, had succeeded, without neglecting his military duties, in improving his valuable inheritance in such a manner that few Georgian nobles can compare with him in wealth." Despite his loyal service to the Russian crown, Chavchavadze’s nostalgia for Georgia’s lost independence, monarchy, and the Georgian Orthodox Church once again pushed him into rebellion, joining the 1832 conspiracy aimed at organising a large-scale uprising against the Russian hegemony. The failed coup plot turned into a disaster for the Georgian literature: most of his poetry written between 1820 and 1832, inspired by Romanticism and egalitarianism, was burned by the author as possible evidence against him. He was sentenced to the five-year exile to Tambov, but the tsar, who needed his military talents given the ongoing Caucasian War, forgave him. Chavchavadze joined the expedition against the rebellious mountain people of the North Caucasus. Like his many fellow Georgian nobles, he found a good opportunity to take revenge for the numerous past raids on the Georgian marches organised by North Caucasus tribes. In his Romantic poems, Chavchavadze dreamed of Georgia's glorious past, when "the breeze of life past" would "breathe sweetness" into his "dry soul." In poems Woe, time, time (ვაჰ, დრონი, დრონი), Listen, listener (ისმინეთ მსმენნო), and Caucasia (კავკასია), the "Golden Age" of medieval Georgia was contrasted with its unremarkable present. As a social activist, however, he remained mostly a "cultural nationalist," defender of the native language, and an advocate of the interest of Georgian aristocratic and intellectual elites. In his letters, Alexander heavily criticized Russian treatment of Georgian national culture and even compared it with the pillaging by Ottomans and Persians who had invaded Georgia in the past. In one of the letters he states: The damage which Russia has inflicted on our nation is disastrous. Even Persians and Turks could not abolish our Monarchy and deprive us of our statehood. We have exchanged one serpent for another. 1 2 Allen, WED (1971), A History of the Georgian people: From the Beginning Down to the Russian Conquest in the Nineteenth Century, New York City: Barnes & Noble, p. 234. 1 2 Blanch, L (1995), Sabres of Paradise, Carroll & Graf Publishers, ISBN 0-88184-042-4 , p 54. ↑ Goldstein, D (1999), The Georgian Feast: The Vibrant Culture and Savory Food of the Republic of Georgia, University of California Press, ISBN 0-520-21929-5, p. 53. ↑ Van Halen, Don Juan. Narrative of Don Juan Van Halen's Imprisonment in the Dungeons of the Inquisition at Madrid: And His Escape in 1817 and 1818. New York: J & J Harper. p. 269.